Democratization in 1999 set in motion substantial reforms to the Indonesian military which made significant progress towards converting the military to a civilian role. These included separating the military from the police force, removing reserved seats for the military from the People’s Representative Council, and other changes. It is very clear that Indonesia’s military never “got out of politics” or “went back to the barracks,” if for no other reason than the fact that significant portions of the military’s budget still do not come from the official state budget. Instead, funding is generated by the military itself. But Indonesia’s military reforms did make substantial progress on a number of fronts. The best work on the nuances of this period is by Mietzner. In recent years, however, progress has stalled, and it is evident that Indonesia’s military—either as a corporate body, or among important leaders—does continue to insist that its interests extend far beyond a traditional “Western” notion of defense. 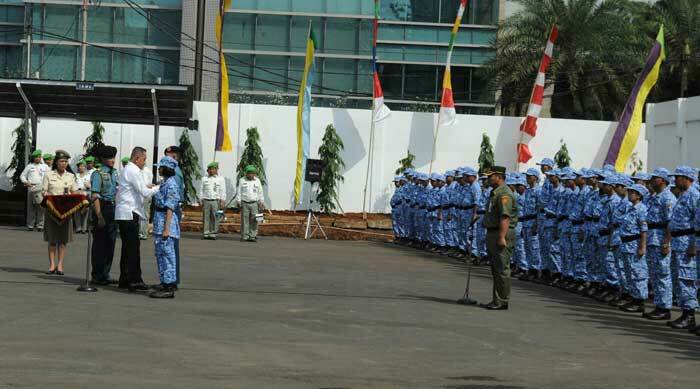 The new program Bela Negara, launched last week by Defense Minister Ryamizard Ryacudu, marks the most visible sign yet of the re-militarization of Indonesian politics and society. By re-militarization I do not mean that the Indonesian military is entering domains in which it had left; as observed above, in most domains, it never left in the first place. Rather, I mean two things. One, a visible reassertion of military prerogative in domains in which the military has been relatively inactive, or in which activities have remained out of the public eye. And two, a revival of a New Order-era language of defense against imagined threats, one that implicates all Indonesians in a common project of maintenance of the state and nation. What I find particularly meaningful is the effort to deny that a program called “Defend the State,” and proposed by the Department of Defense, amounts of militarization. This effort, to non-Indonesians, is simply bizarre. Here is a press release. jelas bahwa bela negara bukanlah wajib militer, bukan militerisme, bukan militerisasi dan bukan pula sebuah usaha pembelaan atau pertahanan negara secara fisik dalam menghadapi ancaman militer. Akan tetapi, sebuah upaya membangun karakter bangsa yang menyadari hak dan kewajibannya untuk berbuat yang terbaik bagi bangsa dan negara, guna menjamin kelangsungan hidup bangsa dan negara dalam menghadapi multidimensionalitas ancaman yang membahayakan kedaulatan negara, keutuhan wilayah dan keselamatan bangsa. it is clear that “defend the state” is not a military service requirement, nor militarism, not militarization, not even an exercise to defend the state physically against a military threat. Rather, it is a way to develop national character that recognizes the rights and responsibilities to do good for the nation and the state, to assure the continuity of the nation and the state in confronting the multidimensional threats that endanger state sovereignty, territorial integrity, and the well-being of the nation. There is something so very New Order about this insistence that using the military to inculcate military values does not amount to militarization. Look at the picture that accompanies the above press release. One might be forgiven for thinking that this is just a touch militaristic. Still, Bela Negara draws on some common themes that aren’t just about the Indonesian military. One is a conception that pervades Indonesian political life about national character as an ideological project. One sees this in Prabowo Subianto’s campaign, in aspirations for a political culture that is adab [= civilized], and also in Jokowi’s “Mental Revolution.” Mass political culture in all of these different examples is something that must be cultivated (perhaps by politicians), and that is somehow currently deficient. Military leaders also exploited the natural tendency toward cohesion and cooperation in rural village life. The funding for the militarized local organizations came from the community, not the national government, reinforcing each village’s financial and psychological sense of investment in the military. Responsibilities for civic services such as fire departments were given to local military reserve units, so that the line between civil and military functions often disappeared. You can easily see the parallels with Indonesia under the New Order. Total people’s defense emerges in the 1950s as a central principle in Indonesian military doctrine, and today shows up as the term hankamrata (pertahanan keamanan rakyat semesta), which adds a concept of security or safety [= keamanan] but does not change the meaning. Re-militarization as described above is a qualitatively different thing than the persistence of odious paramilitaries like Pemuda Pancasila, the military protecting private mining activities, forbidding public discussion of the killings of 1965-66 at a writer’s workshop, or the invocation of vague ill-defined threats to explain restrictions on movement and speech. Re-militarization is a mobilizational project predicated on, first, legitimating the rejection of a boundary between military and national interests, and second, mass participation in an undefined threat to both state and nation. Both legitimation and participation elements of that project became contested in ways never before possible after 1999. And that is important. One thing that does distinguish contemporary Indonesia from the New Order period is the possibility of discussion and criticism. Critics of this new and still fuzzy Bela Negara program do exist and are vocal: see here and here. (On the other hand, Prabowo likes it.) So it is not right to say that re-militarization has happened, or is complete, or is inevitable; it is none of those things. I am sure that those analysts of military and politics in Indonesia can tell us a lot more about the deep politics of re-militarization, and the extent to which programs like Bela Negara are more of the same, something new, or simply huff and bluster.